This is the shrine of Mary#3.I have this thing about the 3 Mary's. I played on this theme a little. The watch part, keeping time. 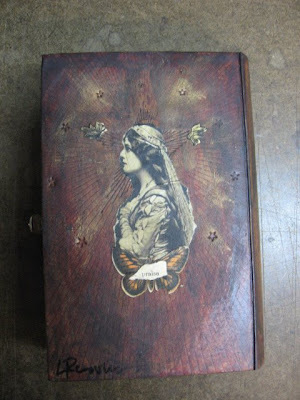 The three Mary's that are physically in the assemblage. 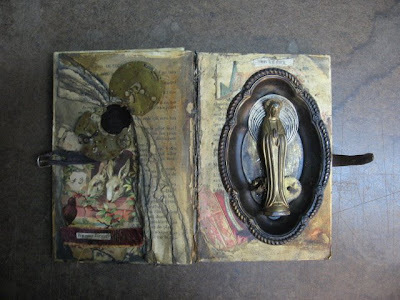 This is another one of my new concepts in altered books, where the book has no real pages to turn and it is really just for the shell. I love the cover of this book with the embossed stars When I found it at a yard sale earlier this year I knew I would have to bring out that element more. The book had a white cover that I painted a la De Meng, serial killer red. Love this color... The inside pages are painted to look more aged. The Mary inside I bought earlier in the year from a great etsy seller, Other People's Flowers. The owner of this shop is a terrific mixed media artist herself. 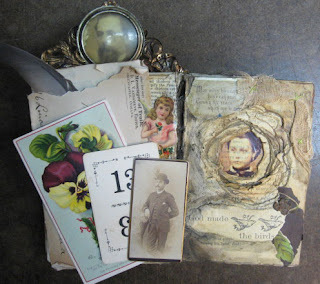 Crystal sells incredible flea market finds and embellishments for altered art. I love her show and can spend hours musing over the delights she has there. 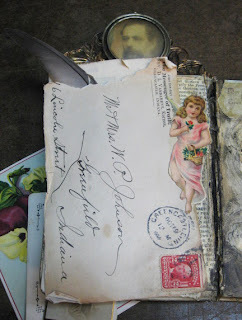 Embellished with scrap from an old vintage book I found on Ebay. I love the scary little bunnies and bird. The watch parts I scored at the Waterbury Flea Market. The silver tray that Mary sits in was painted as well. That one was found at a yard sale. An old wrist watch band is the closure- Now I know why I keep all this stuff. The inspiration for the closure came at the 11th hour and I had to re-glue the front and back covers to make it work. 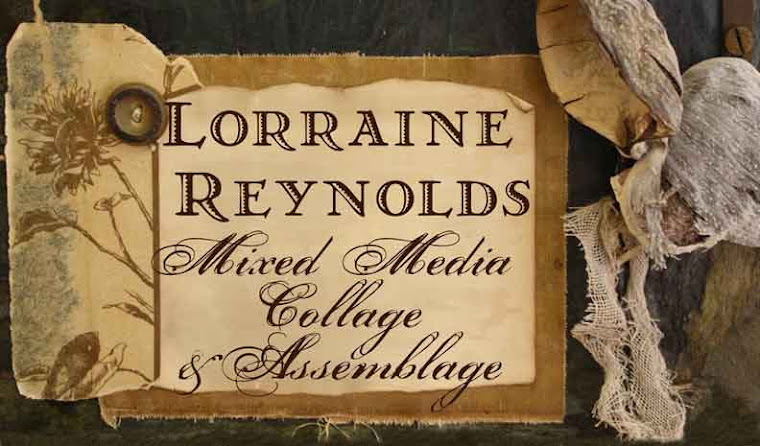 I was lucky to put it all together in time for the Book Arts Show. Nancy Stone was laughing at me, but I still had glue stuck to my fingers at the opening, for the second year in a row. Here's a new Etsy Treasury I created tonight. Inspired by my latest favorite tune. Click on the picture to go directly to the treasury! 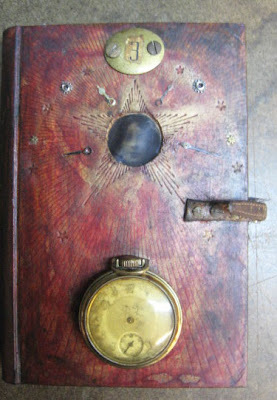 This is one of the two pieces I made for the Celebration of the Book Show at the Firehouse Gallery. It opened on Friday night, and I hopped between the Burton Art Hop Reception and the Book Arts Reception. 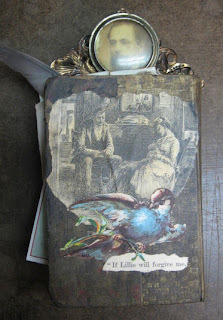 I was working on new technique with these altered books. The are old books, that I selected because of the texture and feeling of the covers, not necessarily for their content. 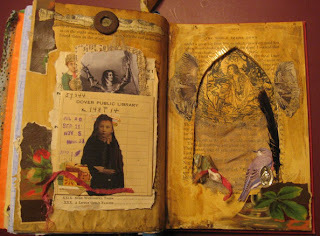 I decide to make them much more like the assemblage shrines I have been doing all summer- less pages and more found materials. 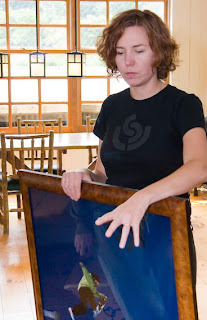 I started out with a feel story, it just came to me as I was working, liquid nails hardening to my finger. It felt like when I did the piece, "i remember you." It just sort of came out of me and a gush. 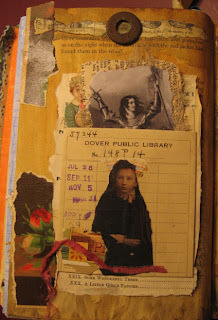 I finished it in record time for an altered book, three days. 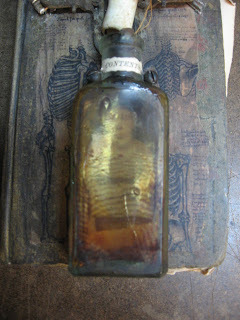 I've named the girl inside the bottle and inside the book, Lillie. She is 13. The Messenger of Truth is a travelling man of the cloth, who is friends with Lillie's parents. One summer he comes to visit the family. It is a summer that will change Lillie for the rest of her life. God made the bird and all the precious beautiful things on the earth. Lillie was a good little bird. Laura's book was beautiful, I loved her theme and what she did. She has a unique and inspiring point of view that is full of life and joy- I decided to create a little shrine in the back of her book- as there was still many pages left. 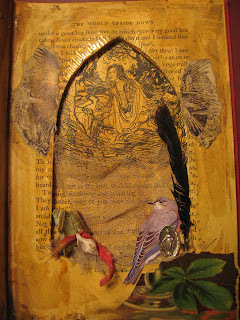 When I was cutting out the niche- one of the illustrations of the original text (she used an Illustrated Grimm's Fairy Tales) came through with a maiden in the wood- EXACTLY in the center of the niche. Spooky.... Art directing itself.... So that's where I left it. Joan the maiden in the wood- full of inspiration. Wow! What a day I had! With help from my tireless team, Molly and Laura, we finished up the last details of making tags for last minute entries, re-hanging work and creating a even program. Getting artists to submit bios or statements has probably got to be THE hardest thing in putting together a show. Wow- like "pulling teeth from a wet fish! ", to quote a colleague and fellow artist. The show opened last night with a reception, at 80 Industrial, music, food, booze. I had to have at least one Magic Hat Circus Boy, before they were all gone. And what a successful night it was. Tons of people, coming into the building, checking out the employees art. I think a few pieces are even going to sell. Marie Michelle, expertly put together the party. She's the best! She made working on this project such a joy! There was also a Collaborative Artist Snowboard Exhibit that featured original art and the manufactured snowboards of over a half a dozen artists. Local Burlington artist Mikey Welsh was on site to do a live painting that was auctioned off to benefit Burton's non-profit company Chill. It was a fantastic night. I wish I had taken more photos. Especially of the employee group show. 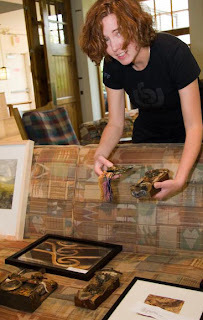 Last Saturday, Andrew Sawtel from the 7 Days came an took some photos of us hanging the Burton Employee Show. I was so lucky to have Molly, Kim, Heather, and Marie Michelle to help hang. We have 22 employee "after-hours" artists in the show, with roughly 60 works of art. I am so proud of the work the did. The show looks fantastic and we got a write up in 7Days too! Under the title "Getting on Board."